[S411] California Death Index, online Ancestry.com, Robert W. McIntyre, Ancestry.com, accessed August 12, 2013. [S1794] Anna M. McIntyre Cemetery record, National Cemetery Administration - Nationwide Gravesite Locator, Provo, UT, [database on-line], Ancestry.com, accessed August 12, 2013. [S1796] Anna M. McIntyre, funeral record, Ancestry.com, accessed August 12, 2013. [S1831] Manual and Anna McIntyre Cemetery marker, Golden Gate National Cemetery, San Bruno, California, Photo of gravestone provided by Joanie Zandona, September 18, 2013. [S2110] Anna M. McIntyre Suhr Funeral Home Record;, Find-A-Grave, Accessed May 12, 2015. [S1676] Find A Grave, online http://findagrave.com, Robert W. McIntyre, accessed January 16, 2019. Memorial ID 132663384, created by Robin W. on 11 July 2014. [S1676] Find A Grave, online http://findagrave.com, Rosa C. McIntyre, accessed January 16, 2019. Memorial ID 132663383, created by Robin W. on 11 July 2014. [S1497] 1910 US Census, Oregon, Clackamas County, Highland Precinct, Washington, DC, ED 33, Page 3B, Ancestry.com, accessed April 3, 2012. [S1503] Banner-Courier, July 8, 1932, page 1. [S1612] 1930 US Census, California, San Francisco County, San Francisco, Washington, DC, ED 268, page 16B, Ancestry.com, accessed June 22, 2012. [S2181] U. S. Social Security Applications and Claims Index, 1936-2007, online www.ancestry.com, Stanley George McIntyre, accessed Ancestry.com 2016. [S309] US Social Security Death Index, 1935-Current, Ancestry.com, Stanley G. McIntyre entry, acessed August 15, 2013. [S1616] Bartolo McIntyre, Piave Passenger manifest, February 3-12, 1917, Ancestry.com, accessed June 22, 2012, M1410, roll 217. [S1617] Bartolo McIntyre, West Islip Passenger manifest, January 22 1927, Ancestry.com, accessed June 23, 2012, M1388, roll 2. [S1810] 1940 US Census, California, San Francisco County, San Francisco, Washington, DC, ED 38-327, page 3A, Ancestry.com, accessed August 15, 2013. [S1809] Dun & Bradstreet Reports, online www.corporationwiki.com, Barclay J. McIntyre entry shows relationship to Stanley G. McIntyre. Accessed August 15, 2013. [S1676] Find A Grave, online http://findagrave.com, Stanley G. McIntyre, Chico Cemetery, Chico, California, FAG Memorial 115520206, accessed March 20, 2015. [S370] Oregon City Enterprise, September 11, 1908. Note*: He It was required to register a birth within three months or be fined. So, it was common that many births are registered incorrectly, i.e., later than actual, so the parents were not fined in April 1878. Note: He There were two shafts at the Victoria Colliery, located on the South East of Standish, approximately 100 feet to one side of the main railway line from London to Glasgow. Sinking commences at North Pit on 15th May, 1900; a man named Cowburn being the sinker. The first brick was laid on 24th May, Queen Victoria's birthday. South Pit sinking commenced on 25th June, 1900; the first brick being laid as the Royal Train passed the site taking the Queen to Scotland. On 2nd February 1901 the first wagon of coal went out from Victoria Colliery - this was from the Riding Mine sunk through at a depth of 76 yards, 2 feet 9 inches. On the same day a service was held at the pit in memory of Queen Victoria, who had died a few days earlier. Biography*: The ship S. S. Majestic, part of the White Star Line, left Liverpool, England on April 13, 1904. On April 14 it stopped at Queenstown (now Cohb), Ireland picking up the remainder of its passengers before making the Atlantic crossing. Thomas J. McIntyre boarded the ship in Queenstown. Per the New York Times of April 21, 1904, the ship Majestic was "off Fire Island at 9:18 p.m. April 20." The following day the April 22, 1904 New York Times reports the Majestic arrived on April 21. For April, the weather was quite cold when Thomas arrived. The evening of April 20 it was only 34 degrees, more than 20 degrees colder than average for that time of the year. It would warm slightly the next day, but still be colder than normal. Note: In America, the Division is the basic unit of the Ancient Order of Hibernians. Divisions are combined into County Boards, which are in turn governed by State Boards, and an overall National Board elected every two years. Annual dances, concerts, and parades sponsored at all levels of the Order raise millions for charity while providing a showcase for the positive contributions the Irish have made in every walk of American life. Divisions and Hibernian Halls across the country have traditionally provided a welcome for new immigrants. Here, the unique art, dance, music, and other interests of the Irish are fostered and preserved, making the AOH a home away from home for many. They are at the forefront of support for issues concerning the Irish such as Immigration Reform, MacBride Legislation, and the Right to Life. They serve their Church well, yet, they never forget their ancestral homeland, and can always be found lobbying, praying, and working for the total independence of a united 32-county Ireland –– as their constitution avows: ``by all means constitutional and lawful''. Death*: Thomas died on 24 December 1939 at St. Anne Hospital, Chicago, Cook County, Illinois, USA, at age 61. [S755] Thomas McIntyre, Irish Birth Certificate no. 130 (September 17, 1878). [S16] Thomas McIntyre Baptismal Record, Certificate: Photocopy of certificate in personal file of Elaine M. Beaudoin. Certificate dated 1 January 1918, signed by Rev. Quinn., 14 April 1878, St. Attracta Church. [S970] Baptismal Registers 1845-1880, Thomas McIntyre Baptismal Entry: Family History Library, MF# 0926015, Salt Lake City, Utah, April 14, 1978, St. Attracta Church. [S975] Marriage Register: entry for Thomas J. McIntyre and Helen Walsh, September 4, 1910 Nativity of Our Lord Church, Chicago, Illinois, Family History Library, Salt Lake City, Utah, MF# 1763436, Item 3. [S16] Thomas McIntyre Baptismal Record, Certificate: Photocopy of certificate in personal file of Elaine M. Beaudoin. Certificate dated January 1, 1918, signed by Rev. Quinn., 14 April 1878, St. Attracta Church. [S754] Thomas J. McIntyre, Illinois Certificate of Death. [S2684] Thomas McIntyre, Ireland, County Sligo, Tubbercurry, Aclare, Lislea birth registration Page479, line 130; ID#02080602, Although the birth registration give a birth date of July 14, 1878, he was baptized on April 14, 1878. Since there were fines if a birth wasn't registered with a set time frame, many early Irish birth records are off by a few months. That is what appears to be the issue in this case. Thomas always celebrated his birthday on April 14, 1878. (September 16, 1878). [S2181] U. S. Social Security Applications and Claims Index, 1936-2007, online www.ancestry.com, Thomas J. McIntyre, death claim date 18 May 1940. [S521] 1901 British Census, Lancashire County, Standish with Langtree, London, England, RG 13/3547, page 11, household 47, Ancestry.com, accessed September 7, 2005. [S955] Standish History, online www.standish-history.org.uk, accessed December 8, 2002. [S513] Archives of the Clerk of the Circuit Court of Cook County Petition for Naturalization, no. 142375 (7 October 1910), Cook County, Illinois, USA. [S82] Thomas Joseph McIntyre, Line V Star Majestic Passenger Manifest, 14 April 1904; From 04-04-21 to 04-04-24, reel 449, Vol 859, 860, 861, Reel 449. [S1165] New York Times, April 21-22, 1904, Various pages, ProQuest Historical Newspapers, Accessed April 5, 2010. [S514] Archives of the Clerk of the Circuit Court of Cook County Declaration of Intention, no. 4971 (18 March 1903), Cook County, Illinois, USA. [S873] Lawrence McIntyre, Majestic Passenger Manifest, Arrival date April 29, 1909; Film, T715, Ancestry.com, accessed April 22, 2007, Roll 1253, Line 9. [S520] 1910 US Census, Illinois, Cook County, Chicago, Washington, DC, ED 700, Sheet 4A, line 30, Ancestry.com, accessed September 6, 2005. [S520] 1910 US Census, Illinois, Cook County, Chicago, Washington, DC, ED 700, Sheet 4A, line 30, Ancestry.com Accessed September 6, 2005. [S951] McIntyre-Walsh marriage license no. 544397, issued September 2, 1910. [S971] National Archives and Records Administration Naturalization Index, p. 2879, Naturalization Index for Northern Illinois, Soundex M535, #M1285, Reel 118 (October 7, 1910), Washington, DC. [S971] National Archives and Records Administration Naturalization Index, p. 2879, National Archives, #M1285, reel 118 (October 7, 1910), Washington, DC. [S571] Mary Celia McIntyre, Illinois birth certificate no. 11773, Family History Library, MF # 1288214 (June 25, 1911). [S752] John Francis McIntyre aka Lawrence, Illinois Report of Birth Certificate no. 16536 (January 10, 1913). [S990] Baptism Register, vol. III, page 299, Lawrence Francis McIntyre Baptismal Record: Family History Library, Salt Lake City, Utah, MF# 1703795, Item 3, January 19, 1913, St. Malachy Church. [S575] Blanche Catherine McIntyre, Illinois birth certificate no. 14482 (April 21, 1914). [S575] Blanche Catherine McIntyre, Illinois birth certificate no. 14482, Family History Library, MF#1288321 (April 21, 1914). [S763] Ellen Patricia McIntyre, Illinois Certificate of Birth no. 8402 (April 21, 1916). [S564] Thomas J. McIntyre, Illinois birth certificate no. 26080, Family History Library, MF # 1,308,899 (August 27, 1919). [S954] Chicago Tribune, December 26, 1939, Record no. 19391226dn073, accessed February 2, 2005. [S956] Ancient Order of Hibernians, online http://www.aoh.com/index.html, accessed July 23, 2009. [S285] Family History Library, Mt. Carmel Cemetery, Burials. Biography: Fr. Mac celebrated his 25th Jubliee. The handwritten invitation he sent out read as follows: "The marking of milestones in one's life is a time of happiness and joy....things to be shared with family and friends. This year on June eighth, I will celebrate my twenty-fifth anniversary as a Priest. I would like you to share this dy of joy by offering with me the Eucharistic Sacrifice on June eighth at two o'clock here at the Seminary Chapel.... followed by an hour of social enjoyment from three to four o'clock. I hope you will be able to join me on this happy occasion. Biography*: A Proclamation of the City Council of the city of Montebello, California adopted and present to Father Thomas J. McIntyre, C.M. Now, Therefore, I Catherine P. Hensel, Mayor of the City of Montebello do commend and thank Father Thomas J. McIntyre, C. M. on behalf of the city Council of the city of Montebello, its employees and residents and especially members of the congregation of the Miraculous Medal Church for your many years of devotion and service to the community, on this occasion, your farewell reception in the parish hall of Miraculous Medal Church on Sunday afternoon, September 16, 1979 and add that it is dedicated individuals like yourself which make the world a far better place in which to live. Honor*: He was honor in May 2000; Rev. Thomas J. McIntyre, C.M. On the occasion of your 50th Anniversary of ordination to the priesthood, we extend to you our deepest gratitued for your service to so many people, in so many places, with so much love. May God bless you "Ad Multos Annos!" May, 2000. It then lists all his posts as a Vincentian. The Rev. Thomas J. McIntyre, C. M.
Death*: He died on 29 November 2009 at San Juan Capistrano, Orange County, California, USA, at age 90. Elaine Beaudoin received a phone call from Fr. Andy Bellesario, Provincial, telling her that Fr. Tom passed away around 4:00 a.m. on the morning of November 29. Services are planned in Laguna Beach on Thursday and in Montebello on Friday, December 4, where he will be buried. Obituary: Father Thomas J. McIntyre, C.M., August 17, 1919 - November 29, 2009. Father Thomas J. McIntyre, C.M., 90, died of natural causes on Sunday, November 29th in Silverado Care Center, San Juan Capistrano. 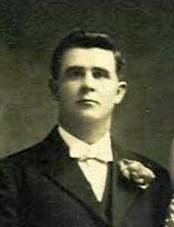 The son of Thomas J. McIntyre and Ellen Walsh, he was born in chicago on August 17, 1919. Fr. McIntyre entered the Congregation of the Mission (Vincentian Fathers and Brothers) on October 17, 1942 and professed perpetual vows in the Congregation on October 18, 1944. He was ordained a priest in the Congregation of the Mission at St. Mary's Seminary, Perryville, MO on June 4, 1950. "Father Mac" had been resident assisting priest at St. Catherine of Siena Catholic church in Laguna Beach from 1990, when he retired from active ministry, until August of 2008 at which time he moved into assisted living at Belmont Village in Corona del Mar, CA. 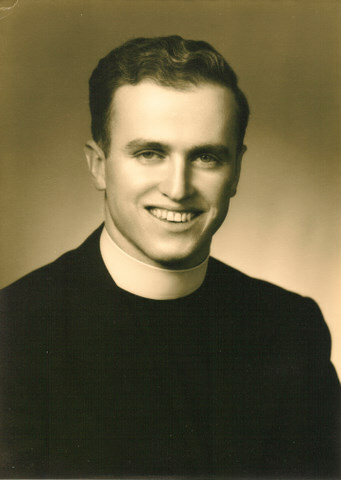 Prior to his retirement, Father McIntyre served as associate pastor (1982-1990) at St. Vincent de Paul Church in Huntington Beach, CA, in the Diocese of Orange. Most of "Father Mac's" priestly ministry was within the Archdiocese of Los Angeles, beginning in 1951 when he was assigned as teacher and Dean of Students at Our Lady Queen of Angels Preparatory Seminary in San Fernando. He served there until 1957. He also served as Superior and Rector of St. Vincent's Preparatory Seminary in Montebello, CA from 1959 to 1965. From 1975 to 1979 Father McIntyre was Pastor and Superior of Our Lady of the Miraculous Medal Parish in Montebello, CA. Over the years he also served in several administrative capacities for the Vincentian Fathers and Brothers, Province of the West. His warmth and humor attributed to his popularity wherever he served. He was recognized as one who tried to be faithful to the charism of St. Vincent de Paul by organizing and leading programs of outreach to the poor in the various parishes at which he served. A vigil Mass was celebrated for Father McIntyre at St. Catherine's in Laguna Beach on the evening of December 3rd. A memorial Mass was also celebrated at St. Catherine's on Friday, December 4th. The Vincentian Fathers and Brothers, and his family and friends celebrated the Mass of Christian Burial at 11:00 a.m. on December 4th in the Doheny chapel at DePaul Evangelization Center in Montebello, CA. Interment followed at Calvary Cemetery in Los Angeles. Obituary provided by Father William Piletic, C.M. Los Angeles Times, December 2, 2009. Deceased Name: McIntyre, Rev. Thomas J., C.M. [S965] Thomas J. McIntyre C.M. 40th Anniversary slide presentation, April 24, 1990 Elaine McIntyre Beaudoin, personal files. [S2501] 1940 US Census, Illinois, Cook County, Chicago, Washington, DC, ED 103-1915; Sheets 1B and 2A, Accessed via Ancestry.com, June 30, 2017. [S978] Thomas J. McIntyre, World War II Army Enlistment Records ca 1938-1946, Record Group 64, http//aad.archives.gov/aad/record-detail.jsp, accessed August 18, 2009. [S999] Thomas J. McIntyre, "Curriculum Vitae." [S892] Thomas J. McIntyre Ordination Card, June 4, 1950 Elaine McIntyre Beaudoin, personal files. [S964] Thomas J. McIntyre C.M. Plaque, 50th Anniversary, May, 2000 Elaine McIntyre Beaudoin, personal files. [S968] Letter, CM Thomas J. McIntyre to friends and family, May, 1975. [S963] Montebello City Council Proclamation, September 16, 1979. [S969] Letter, Thomas J. McIntyre C.M. to friends and family, May, 2000. [S998] Vincentian Obituary released by Congregation of the Mission, December 4, 2009. Death*: He died on 13 December 1879 at San Francisco, San Francisco County, California, at age 10. McIntyre - In this city, December 13th, William, son of Patrick and Bridget McIntyre, aged 10 years, 9 months and 18 days. San Francisco Examiner, December 15, 1879, page 1. [S1814] Colma Cemetery Index, online http://www.sfgenealogy.com/php/cemetery/cemeteryindex.php, William McIntyre entry, accessed August 16, 2013. [S1820] Catholic San Francisco, online http://catholic-sf.org, http://catholic-sf.org/news_select.php; June 22, 2012. [S1500] Banner Courier, September 14, 1931, page 1. [S1501] Mountain View Cemetery, Mountain View Cemetery Burial Records, Page 145. [S411] California Death Index, online Ancestry.com, Ancestry.com, accessed April 4, 2004; William A. McIntyre entry, cert #6222.